Foundations may not seem like the sexiest of topics but watching one get made will give you a whole new appreciation for what's under the covers of your house. Our crew spent the last couple of weeks constructing our pretty little raised perimeter foundation. I tried to capture the process in photos, as it is quite an impressive production. Several of our neighbors even stopped by to comment on the progress and how quickly everything's moving along. Before construction begins the city requires a licensed surveyor to layout exactly where the house should be and ensure it's not encroaching on the setbacks. Stakes are placed to mark the corners of the house and string runs between them giving a visual outline of the perimeter walls. The surveyor's stakes + string outline the house's footprint. Excavation involves removing the topsoil and digging underground to create the foundation. Unless you're going for the Leaning Tower of Pisa look, it's very important that you do not build a foundation on ground that's too soft to support your structure. 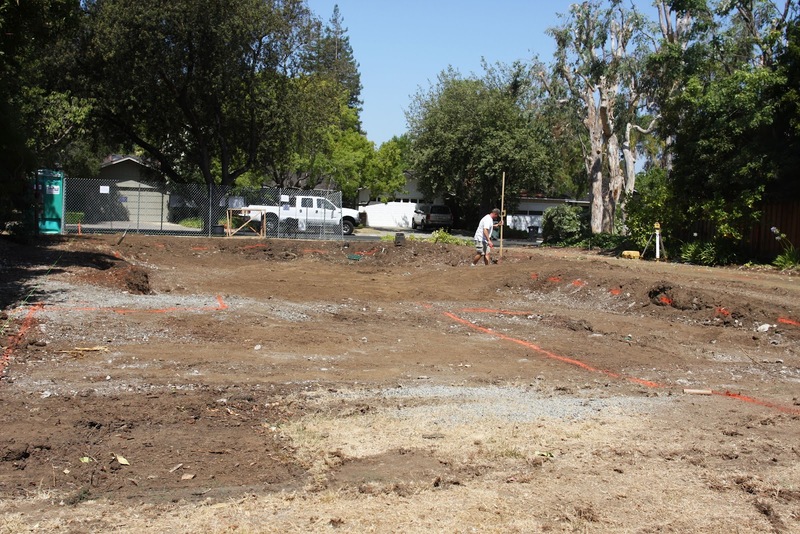 The ground needs to be compacted enough to bear the load of the house. 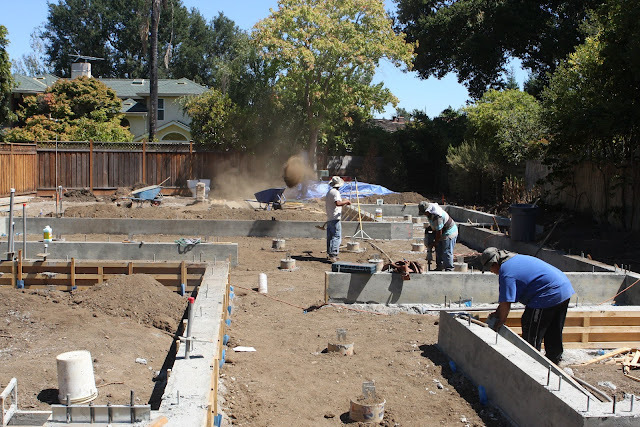 Foundations have two major components: footings and a stem wall. Footings are poured concrete pathways that help spread the weight of the home from the foundation walls to the surrounding soil. In addition to the pathways, oversized mole holes are punched out for piers. Piers are a part of the footing that support girders—vertical beams which carry the floor system. 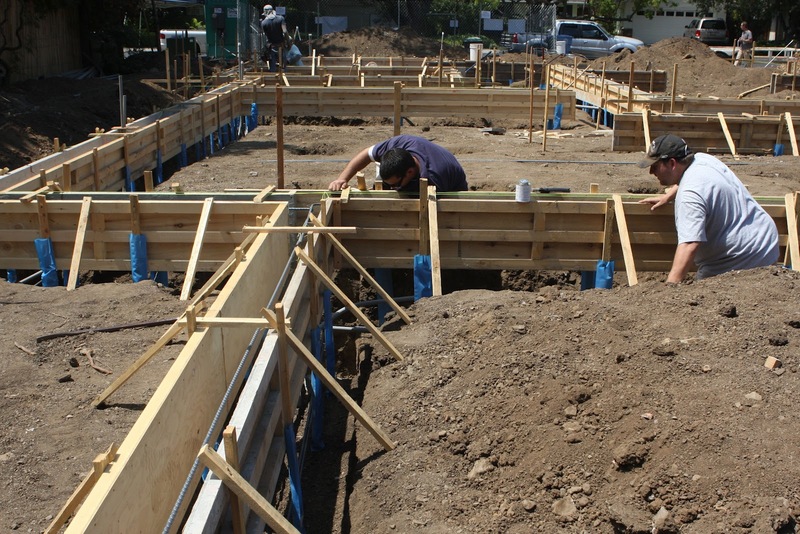 Well built footings ensure that weight is distributed over a large area so that the finished house does not settle. Digging the footing pathways & piers. Palo Alto requires they be at least 20" deep in undisturbed soil. 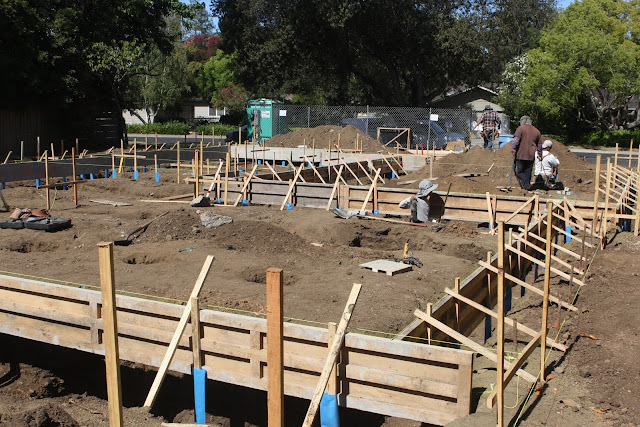 Above the footings sits the stem wall, the top part of the foundation that connects the foundation to the vertical walls of the home. Forms are temporary molds into which concrete is poured to shape the stem wall. Made out of lumber, the forms hang above the footing cavity and need to be sturdy enough to prevent a concrete "blow out" when you fill them. To hold the forms in position, wood stakes are lodged into the ground every few feet and screwed into the form wall. Building forms is hard work. Especially if you have to redo stakes to apply blue sleeves. Hint: Use the sleeves. Before pouring the concrete, steel rebar, short for reinforcing bar, is added to strengthen the footings and stem wall. The rebar holds the concrete together, allowing different loads and weights to be transferred throughout the structure. This helps your house resist shear and bending from conditions like soil movement, earthquakes and wind pressure. Hold downs and anchor bolts are embedded in the cement foundation to anchor to the frame and keep the walls from lifting off. Our general contractor, Jeff making sure the hold downs line up with where the windows will be placed. At this time our plumber came to can out the sewer, creating a place for the sewer line to run through the foundation. 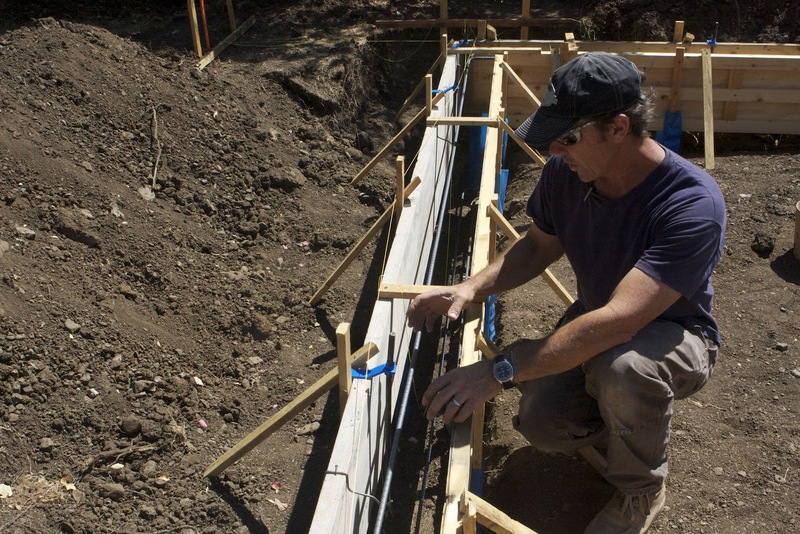 Our electricians set up electrical conduits, a piping system that routes through the footings and across the house. By doing so, they can later snake electrical wiring through the pipes instead of having to run wire on the outside of the house or drill holes through the wall frames. 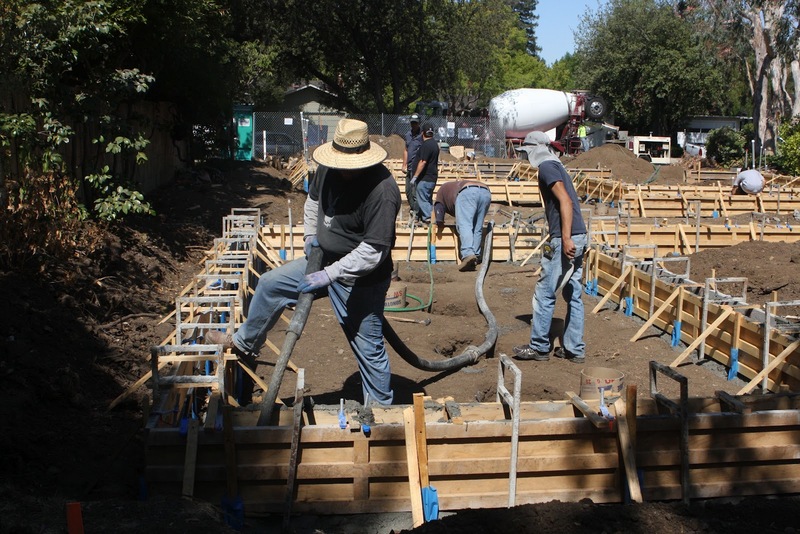 They also set up a required Ufer ground—two 20' long bars of steel that connect to the rebar in the foundation to ground the electrical system (this protects against surges like lightning strikes). Our electricians James and Mark setting up conduits in the foundation. This will save time down the road. 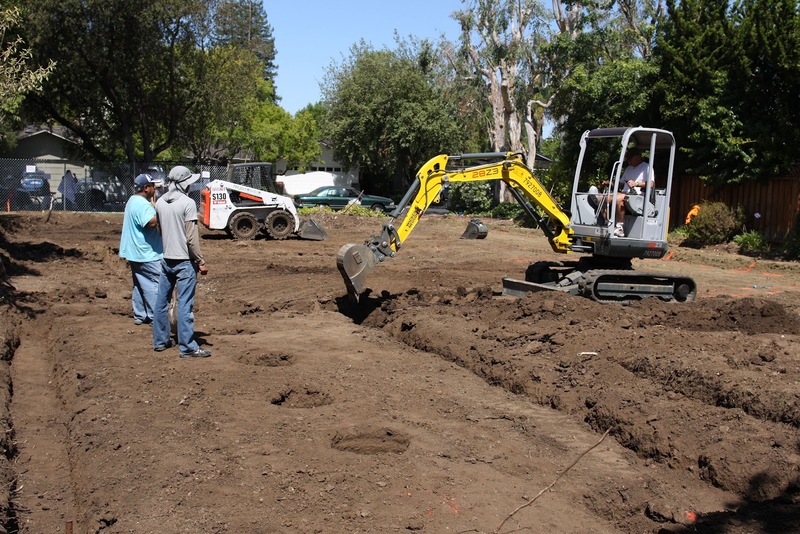 We all hold our breath while our inspector Robert checks out the footings and forms. Woohoo! We passed our inspection so the cement trucks showed up the next day and the crew started pouring. Manufacturing cement takes a lot of energy and produces about 6% of the world's carbon dioxide emissions. To make cement more sustainable you can mix in a recycled product called slag cement. The city gives you one GreenPoint (like brownie points but better) for adding 20% recycled materials and two points for 30%. The slag cement also makes the concrete stronger. Our little foundation ate 6 1/2 truck loads of cement. We added 30% slag cement to make it greener. The cement was poured on Friday and had the weekend to set. On Monday the crew stripped off the forms to reveal a firm, flat, level and square masterpiece. The foundation is done! Or is it? Stay tuned for the sequel...in the meantime if you'd like to learn more check out the foundations and floors chapter in Habitat for Humanity's How to Build a House. Stripping the forms. Almost done! Experienced builders will tell you that every city has their unique quirks and hot buttons. In Palo Alto the head inspector is Bud Starmer. Bud was an exterminator in his previous life so he's vigilant about measures that can prevent an infestation. Personally, I like this about him because I am not a fan of bugs and rats and want all the help we can get on this front. Measures shall be taken to allow all wood stakes and form lumber to be removed. We recommend using Plasti-Sleeve to slip over the wood stake, this product is available at Barron Park Plumbing Supply, 377 San Antonio Street, Mountain View, 650-948-7160. Note: Wood stakes/forms not removed shall be drilled and treated with copper green. For those of you who don't understand inspector English, "we recommend" is code for "do it or fail." If you want to please your inspector, use the Plasti-Sleeves (lovingly dubbed the "blue condoms" by builders in Palo Alto). The idea behind the condoms is that they help you slide the stakes cleanly out of the ground when you're ready to remove the forms. This is beneficial because any wood that is left exposed in or near the ground becomes a feeding ground for subterranean termites (endemic to the Bay Area). We spent about $120 on the blue condoms and another ~$100 in extra labor to put the suckers on. Indeed it was clearly worth the expense when Bud paid us an unexpected pre-inspection visit and gave us the thumbs up when he saw them. However, efficacy was another matter. 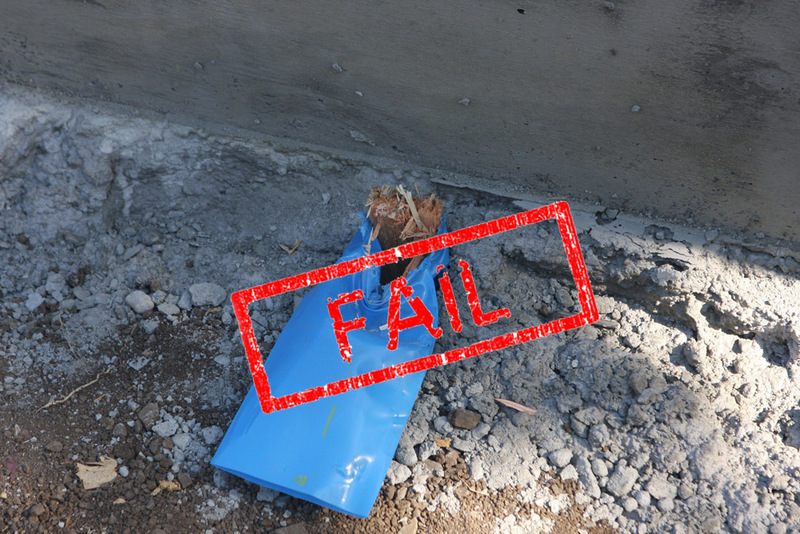 I was shocked and dismayed when not one, NOT A SINGLE ONE, of our condomed stakes would lift out of the cement. Instead we had to snap each stake, drill off as much as we could, and treat the remaining wood with Copper Green pesticide. Bah humbug. Next time we'll use lubricant or pull out sooner. The fact that the blue condoms help may be a fantasy but if it makes your inspector happy, it's worth it. 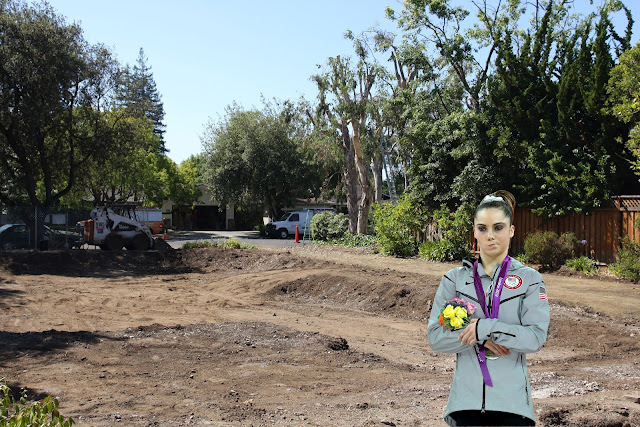 McKayla is not impressed with our sad little empty lot. After setting a world record for fastest deconstruction ever, I was expecting to fly through the next stage of construction. Our building permits were approved and our foundation guy, Carl was perched on the sidelines raring to go. It looked like we had timed the handoff perfectly. Or had we? Rookie Lesson #1: "Your permits have been approved" does not mean you're good to go. It actually means, congratulations we're going to let you start as soon as we figure out how much you owe us and if there's anything else we need from you. How long it takes to calculate your permit fees appears to be inversely correlated to how desperate you are to move forward--8 days in our case. Watching the tumbleweeds blow by our empty lot while waiting for the city to do their fancy math is downright painful. After seven months of planning, an extra week may not seem like much, but there's a new sense of urgency that hits once you have a sad plot of dirt itching for some action. And by urgency, I mean stress for everyone around me. Rookie Lesson #2: Plan for things to not go as planned. Harvard Business Review recently ran an article entitled, The Best Strategy for Reducing Stress. The article says that the underlying source of stress usually boils down to frustrated expectations. Stress occurs when there is a gap between what you expected to happen and what is actually happening. In our case, the city had told us it would take four weeks for the departments to review and make changes to our building plans and two weeks for any re-checks. It would take us one week to incorporate changes so we figured we'd have our permits seven weeks after submitting them and planned to start digging that day. It seemed so simple, what could go wrong? The problem with doing something for the first time is you don't know what you don't know. Getting permits in Palo Alto is just one of many steps that you have to take to be ready to build. When you pick up your permits, the city hands you a 360 page "document" called, Residential Inspection Guidelines that outlines all the building codes and rules you have to abide by. It's unfortunate that they don't give you this before the permits are approved because you can actually get a head start on many of the items. 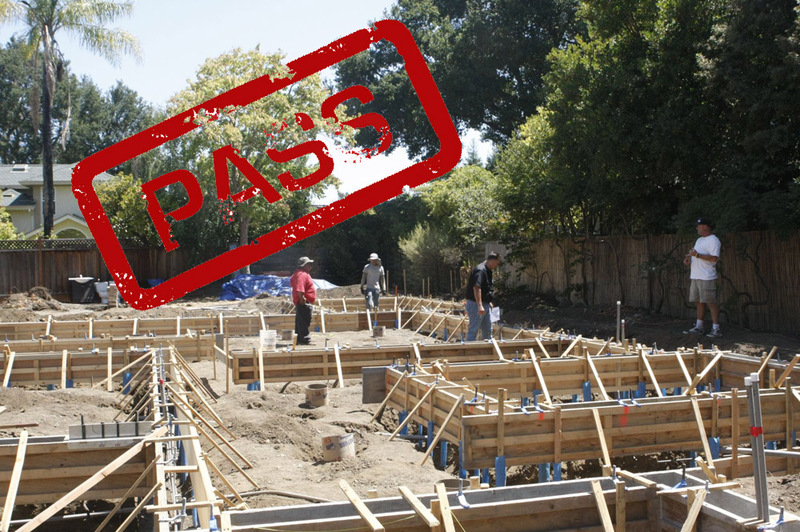 The document lists a slew of things that you have to do before you can start construction, many of them require additional wait time (especially in the summer time when everyone goes on vacation). So what to do about the stress and frustration? HBR says you have two choices: Either change the reality around you or change your expectations. Since trying to change reality often creates additional stress, HBR says that the best strategy for reducing stress is to change your expectations. Indeed, every time I encounter a new delay, I complain to my builder friend, James Witt and ask if there's a workaround. His favorite response is a chipper: Welcome to James' World! 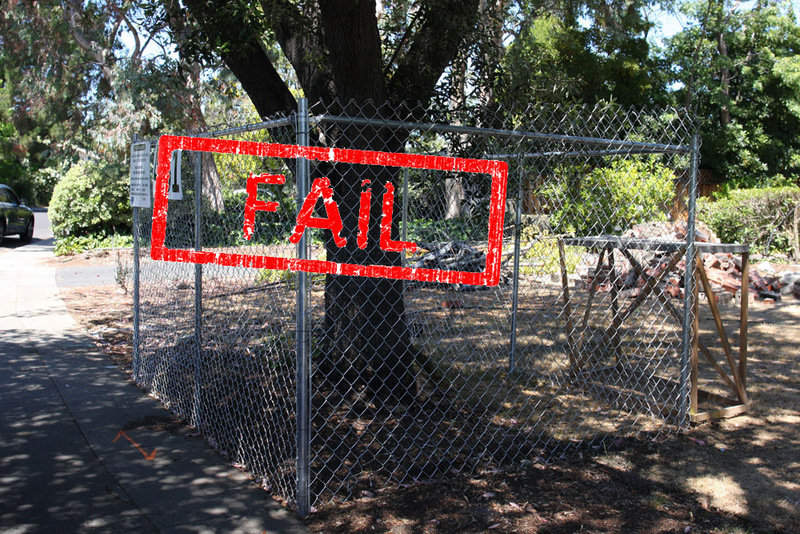 Red tape and bureaucracy is the reality of building a house in Palo Alto. While I've come to expect delays, I'm also trying to minimize the surprises by learning as much as I can in advance. Our general contractor, Jeff has mapped out a rough timeline for the next ten months and we intend to meet every week to discuss progress and problems. Builder James has also started schooling me on some of the "grenades" that the city inspectors like to throw your way. While experience may be the best teacher, having a heads up on what to expect definitely helps keep the stress level down. I've also mentally scheduled in an extra two months into our building plans for unanticipated delays. Hopefully that is enough, otherwise plan for me to be pretty stressed out this time next year. Below are a few of the delays that we learned about the hard way. In our case, these delays added an extra 5 weeks to our schedule. If you plan ahead, you can probably cut this time in half. (Note: the links are current as of August 2012 but may change). Plan an extra 2-3 weeks for approval delays and administrative stuff. Your permits are reviewed by half a dozen departments and can take longer in the summer since people go on vacation. Many of the other items on this list can be done while you're waiting for approvals. Plan to spend at least 2-3 weeks getting through the Pre-Demolition checklist requirements. Keep a copy of all fees that you pay, forms that you fill out, and approvals that you receive. There are so many different departments in Palo Alto that the paperwork often gets lost in the shuffle and not recorded when it should. Having a copy on hand will expedite the process if there are ever any questions. Palo Alto School Impact Fees are due before you can collect your permits. Plan to spend at least one day going back and forth between the offices. They are calculated at the Building Department (285 Hamilton Ave). They'll give you a form that you have to take to the PAUSD office (25 Churchill Ave) to pay. You must then return the stamped form to the building department. A Green Building Application is required if you're going to do a deconstruction. Have your deconstruction specialist fill it out and plan for it to take a couple of days for the city to process it. The Utility Disconnection process is a biach. You cannot start this process until the property is vacant (if you have tenants, they have to be moved out). Plan to spend 1-2 days running around to the departments to submit forms and pay fees then a couple more days for the departments to process these. Once you're in the queue, it takes up to 10 business days for the shut-offs to occur. Request your Temporary Electric Service early. It took us 23 days to get temporary electric service turned on. Having a generator during the deconstruction kept this from slowing us down. 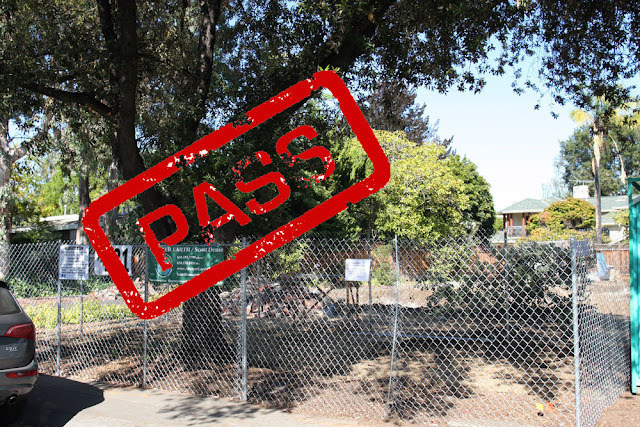 You need a J-number from Bay Area Air Quality Management District before you can get a demolition permit. It requires a payment of $69 and an official asbestos survey report ensuring that asbestos will not be released in the air. Once you submit your application it takes 10 days for them to mail you a J-number. For an extra $476 they'll expedite it to 72 hours. In our case, our awesome deconstruction guy, Rod drove to their SF office and picked one up the same day for no extra charge. Not sure if anyone can do it, (he's on a first name basis with them,) so call ahead and ask nicely. Plan time for the survey if you don't already have one. I hope this list helps other rookie builders out there. Despite the stress, it's been an incredibly fun experience. There's nothing like the joy of learning something new everyday. Having said that, if this all sounds like a headache not worth having, do yourself a favor and go buy one of James Witt's amazing dream homes. We got a big fat F for our first attempt at tree protection. To pass you need to fence off the entire tree canopy (in our case, the whole front yard).